Caledonian MacBrayne's MV Bute on passage from Rothesay to Wemyss Bay. The Scottish Government should step in to end the threat of strike action among CalMac staff represented by the RMT union, according to Scottish Labour’s shadow transport minister. 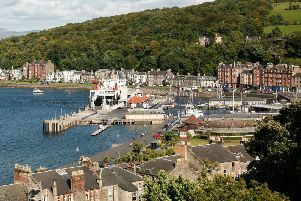 Members of the RMT working for CalMac Ferries Ltd last week voted in favour of strike action, and action short of a strike, in a ballot over jobs, pensions and working conditions. David Stewart MSP, who is also a ‘list’ MSP for the Highlands and Islands, raised the issue at Topical Question Time in the Scottish Parliament chamber on Tuesday, asking the Scottish Government how it planned to respond to the concerns of CalMac employees. The issue has come to the fore after it became clear that the fight to win the next Clyde and Hebrides Ferry Service (CHFS) contract, due to begin in October 2016 and last for up to eight years, will be a two-way fight between the incumbent operator, CalMac Ferries Ltd, and private sector firm Serco. “Ninety per cent of those who voted backed calls for industrial action,” Mr Stewart said, “and I have genuine and heartfelt sympathy for the workers involved. The Scottish Government owes it to these workers to resolve this dispute. “Does the Scottish Government share the view of the RMT general secretary Mick Cash, who said ‘RMT members on CalMac rightly feel that they are caught in the crossfire of an unnecessary and damaging tendering battle that leaves jobs, conditions and pensions hanging by a thread’? Speaking after the exchange Mr Stewart said: “The result of the RMT strike action ballot was overwhelmingly in favour of taking industrial action, something everyone involved would like to see adverted if possible. This is a crucial issue and the Scottish Government can not stand on the side-lines.